Interesting post. I think Peter Singer would be appalled at this. To tell the truth, I haven’t read Peter Singer but I have read some papers written by a Prof in my department, Kai Chan (http://research.ires.ubc.ca/kaichan/), who had worked with Peter Singer. In one of those papers, Prof. Kai Chan talked about the dilemma of having to choose between species for conservation purposes, for which he argued that an animal’s sentience could be the criteria. In others, he talks about the different kinds of valuable services provided by ecosystems to advocate against people’s tendency to think of ecosystems as having a very limited significance, such as tourism or provision of life. Yea, it’s quite possible Singer would be appalled by this practice, as well as my analysis. I’m venturing out into less familiar territory here…. I do want to highlight, however, that I’m not certain that the release of the fish does have a hugely negative impact on the environment. 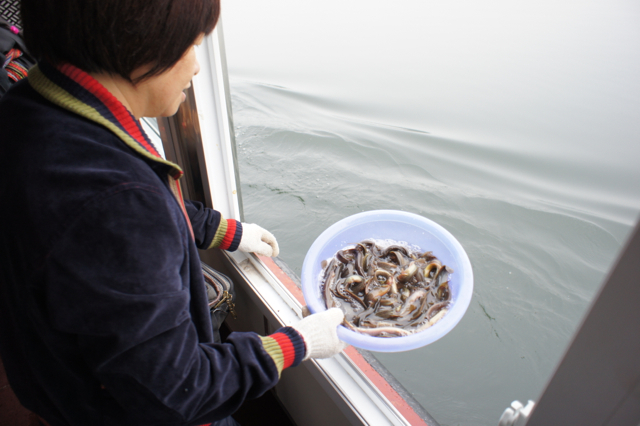 By releasing native fish, and distributing them across what is in fact a very large lake (more than a half-our by motor boat from one side to another), those doing this tsetar are trying to minimize their impact. So I don’t think we can assume that this is a question of saving a few fish versus destroying an ecosystem, but rather something in between. My own interest here is more about where the basic ethical unit lies, with the animals or with the lake. Singer, as I understand him, locates it with the animals, with the lake playing a support role, a position which seems to me to be at least somewhat similar to the stand these Tibetans and Chinese are taking. Certainly, if we could definitively say that releasing these fish was leading directly to the deaths of other creatures, then I doubt that either Singer or Khenpo Tsültrim Lodrö would approve. Thanks for the clarification. I had the impression, my apologies if I had read it wrongly, that the lake isn’t big and so I felt that the effect of introducing half a million fish in one tsethar to the lake would simply be wrong. At least they are doing this in a proper, natural lake, where the fish have some hope of long-term survival. Here in Beijing we are witness every year to a strange twist on the ritual. 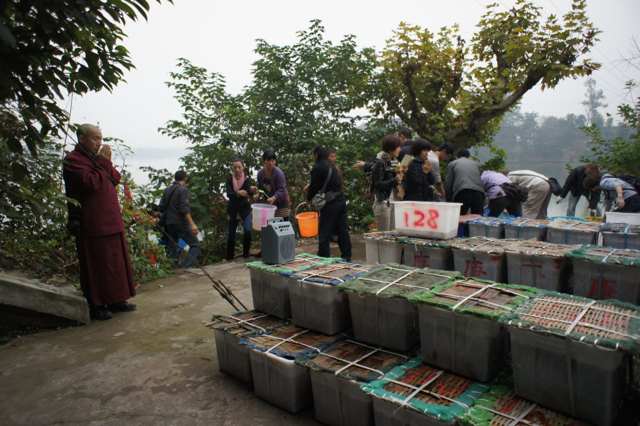 In the spring, Buddhists in our compound release goldfish into the various artificial ponds that dot the grounds. Then in the fall, people (my kids included) try to save as many as they can as the ponds are being drained for the winter. Last year we got four, this year we got eight — now down to six as one died in the bowl and another mysteriously ended up on the floor with his head missing (can’t tell if he jumped out or if the cat managed to scoop him out). I haven’t talked with the people releasing them in the spring yet — would be interesting to know if they have even thought of the eventual fate of those fish that don’t get salvaged. Where do the fish come from? Were they fished by fishermen? I would have thought actually that concern with the individual or a vision of life as only understandable through the individual is a very Western phenomenon. It sounds like Buddhist culture also values the individual, perhaps in a different way? The fish are bought at the wholesale fish market each morning. Some definitely come from the lake, but many others come from nearby aquaculture facilities, which raises its own issues in terms of releasing them into a wild population. You got me thinking about the ‘ethical line’. Allow me to share some of my thoughts. So what are the key contextual factors determining the ethical line for Buddhists? Of course, motivation of the person is always a key factor, morally speaking. It is often the most important factor. The other very important factor is the result of the act. If the act brings happiness or alleviates suffering in the other, it is more beneficial. We are debating or discussing whether the result of saving certain number of fish is more important or the broader, eventual result of introducing excessive number of fish into a lake. This brings us to another factor, considerations of temporal aspect of an act. Buddhists believe actions (good or bad) have more (1000… times more) impact on special days and times like the 15th day of months, or on certain auspicious days, etc. Considerations of situational timing includes notions like feeding or helping someone when s/he is more hungry or needy is more beneficial. An important timing consideration is the difference between short term and long term benefits or harms. For example, beating of students is permissible, if the teacher has the right motivation, because the students will get long-term benefits. Corollary to this is a common Buddhist reasoning that short-term benefits are not worth long-term harm (བདེ་བ་ ཆུང་ལ་ཆགས་པ་དེས། །ཆེན་པོའི་བདེ་བ་ཐོབ་མི་སྲིད།). a) general concerns over impacts of introducing excessive number of animals into a limited ecosystem is very Buddhist (and a good one at that). c) the temporal aspect of the ethical line is more interesting than motivation and result factors. Thanks for your interesting post again! I think you are correct that Buddhist concerns that preference long term benefit and the good of the many over the few would indicate that concern over introducing too many fish into the lake is, in fact, very Buddhist. I do not doubt that if these groups believed that their actions were causing more harm than good, they would stop. The thing that I think aligns them with Singer, and not with many other ethicists, however, is that they don’t make the ecosystem itself the baseline for ethical decisions. We often get a sense in environmental literature a sense that an ecosystem has a life of its own. People talk about the health of an ecosystem as the end in itself, rather than as an instrument towards the health of the beings in that ecosystem. Both Singer and these groups practicing tsetar, I believe, would find that reasoning faulty, and argue that ecosystems don’t need to be preserved for their own sake, but rather for the sake of the animals living in them. I may be wrong, but that’s the correspondence I’m trying to point to here. It just occurred to me that if we look at Buddhists practising tshe-thar, then it would seem that their thinking is more like Singer. But if we look at Buddhists planting trees or collecting garbage from a lakeshore or a mountain, their thinking would likely be more inclined with those of deep ecologists. It’s a fact that most Tibetan Buddhists think like Singer. I think it’s mainly because Buddhism is about mind, the feeling or knowing mind, which they believe rocks, water, and even trees, don’t have. You might find it interesting to know that when we (www.ecotibet.org) do environmental education work in Tibetan communities, we are mindful of this schism (most Buddhists won’t be comfortable with deep ecology type notions) when we address monastic communities. I have had planning/stratgy discussions with my colleagues in India on how to reach out to the monastic community without stepping on their long held views. You know, it is completely inappropriate to challenge the (widely held) views of the monastic community to Tibetans. What we decided to do is simply avoid getting into these discussions and instead use examples of His Holiness the Dalai Lama and Gyalwa Karmapa’s initiatives/ideas on the environment, which always works, of course. So we have the widely prevalent view point, the Singer school of thought, on one hand and the more progressive views of some high lamas, who seem to be taking the deep ecology school of thought, on the other. How about the teachings of premodern revered lama’s? How about Buddhism’s fundamental philosophical ideas about animals and non-sentient things alike? To mistaken intellects, it appears as solid, inanimate objects. To those of pure vision, it is a celestial palace full of deities. First I just want to say how much I’ve enjoyed this discussion. Exchanges like this are exactly what I hoped would happen when I started the blog! You’re definitely right about the deep ecologists being aligned with some form of Buddhism. As you probably know, deep ecologists themselves have often invoked Buddhist ideas, particularly the idea of dependent origination (There’s an article in Buddhism and Ecology: The Interconnection of Dharma and Deeds that discusses this, but I’m afraid I can’t remember the author or title, and I don’t have access to my copy right now, so can’t look it up). It is precisely because I have heard this association before that I was so struck by the tsetar groups. So it seems like you’re right, there are aspects of Tibetan Buddhist culture that echo Singer’s preference utilitarianism, while other aspects can and are used to support a deep ecologist position. Perhaps the most important part of your last comment, however, is the acknowledgement that when actually in the field doing environmental work, it is the examples of figures like the Dalai Lama or the Karmapa that really get people motivated, rather than philosophical opinions. That should put all of us armchair ethicists in our places! Even I really enjoyed these exchanges and thinking about your ideas. What about eel release? Here’s am old story from WTN that you may have overlooked. `I have to say that to commemorate the giving of life seems like an odd way to state the motive for doing it. But they did indeed consult with the fisheries department. MORE than 100 eels will be released into the Yarra River on Sunday as part of a traditional Buddhist practice to commemorate the giving of life. Shenpen Australia will release the eels at Studley Park Boat house to raise money to build a Kindergarten for Tibetan refugee children living in the Dhondenling settlement in Kollegal, India. The Fisheries Department has approved the release of the eels, which are a native fish species of the river. Shenpen Australia member Toey Ng from Balwyn, said that in traditional Buddhist teaching, the practice of giving life to a creature who would otherwise die was believed to be of great benefit to the creature and sponsor. 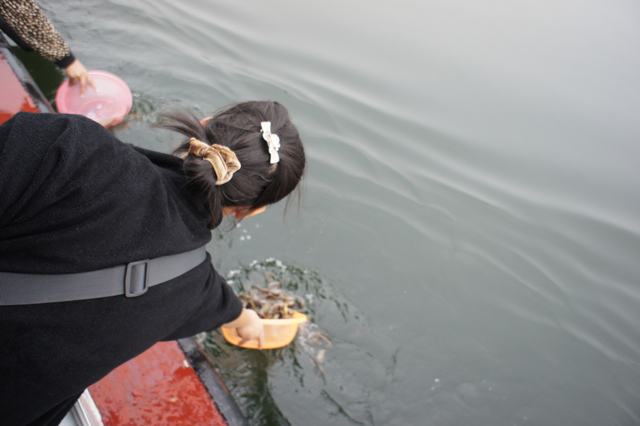 Ms Ng said Dzogchen Rinpoche, a Tibetan Buddhist lama, would bless the fish before they were released into the water. Rinpoche’s education was supervised by the Dalai Lama, who has supported Rinpoche in reestablishing the Dzogchen Monastery in Kollegal. The monastery has educated Buddhist monks and supported the large Tibetan refugee community for many years. The release will take place at 8.30am. hi geoff. ecologies are abstractions, representing the systematic interaction of actors and environments is a fashion that allows sustainable existence for participant species. there is no deep ecologist who wishes to protect ecologies in their own right – any value that defending an ecology has is necessarily accrued from the benefit presumed to exist for the participants in that ecology, and indirectly for participants in other (related ecologies and systems). to propose some conflict between individual organisms and “ecologies” is to miss the point about what an ecology is, and to reify it as some kind of object. Point taken. It thinking about this more, I wonder if the distinction I’m seeing isn’t so much about individual versus ecologies as about the individual being in hand versus the more abstract and invisible beings in the ecologies. I’ll write this up more once I think it through more. So if all the birds die from eating insects poisoned by human-administered pesticides, that’s just part of the greater “deep” ecological plan? It benefits the humans by allowing them to get more bushels per acre, so it is good? I’m not clear on this. Perhaps I’m not deep enough.